Dr. Danny Au is a doctor of Traditional Chinese Medicine. He is certified by the College and Association of Acupuncturists of Alberta and has been practicing Traditional Chinese Medicine for over 6 years! He helps with a number ailments and is well versed in musculoskeletal and visceral conditions as well as preventive care. Dr. Danny’s journey began when he took a trip back to China where he discovered a very effective and natural way to help people heal themselves. After 2 years of study in TCM program at the Guangxi Traditional Chinese Medical University, he returned back to Edmonton where he completed 3 years of advanced study at Reeves College Acupuncture Program. Dr. Danny enjoys working with patients to reach their health goals, whether it is decreasing pain and stress or increasing function and well-being. A traditional method of healing that originated in Asia thousands of years ago, it’s no wonder why acupuncture has stood the test of time—it’s a natural, safe, and effective treatment that uses thin needles to stimulate our internal energy, known as Qi. When properly stimulated, Qi can flow freely and without interruption, bringing wellness and balance as well as restoring the body’s innate ability to heal itself. If you have any questions or you think you are interested in pursuing the benefits of Acupuncture, feel free to talk to Dr. Danny when he is in the clinic as he would love to meet you. We’re excited to now offer acupuncture at City Centre Health Edmonton Chiropractic for the Edmonton community! 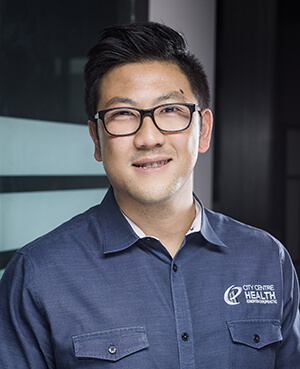 At City Centre Health Edmonton Chiropractic, acupuncture appointments can be made with our TCM staff member who has received their Certified Doctor of Acupuncture. During your first appointment, we’ll take the time to listen to your concerns and discuss how acupuncture can benefit your health. Next, you’ll relax as our acupuncturist places needles into certain problem points on your body. Most patients hardly notice when a needle is placed, making the treatment very soothing. After the needles are placed, you’ll relax for a period of time as your body’s internal balance is restored. Like most things worthwhile, results typically do not occur right away. After a few treatments with us, we’ll get a better idea of your rate of recovery and will set up a treatment plan unique to your specific needs. If you stick with your plan, you’ll enjoy excellent results and even better health. If you’d like to give acupuncture a try, give our practice a call to book your appointment. Discover how this ancient healing art can improve your overall wellness and problem areas. Call to get started on your wellness journey in Edmonton with acupuncture!